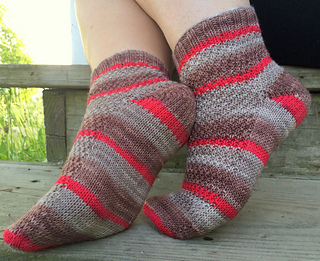 This pattern provides instruction on how to knit a basic pair of toe-up 2-at-a-time socks with a textured leg and slipped stitch German short-row heel. The pattern is written in three different sizes but can be adjusted easily to any gauge or foot size by working the toe increases more or less times than specified in the pattern. You can also use the same instructions to work your socks toe-up one at a time if that’s what you prefer. 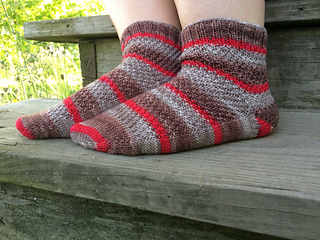 Please note that I don’t provide detailed information in this pattern on how to work German short-rows or 2-at-a-time socks, so if you have never tried either one of those techniques before, please think it through before buying the pattern. 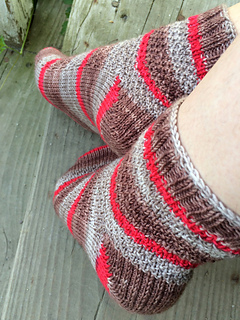 Knit, purl, M1L, M1R, K2tog/P2tog through the back loop, german short rows, Judy’s magic cast-on & toe-up 2-at-a-time (or work socks one at a time following the same instructions).